Taste and feel is more like a Baltic porter. The carbonation is way too high for my taste. Clear light brown in color, topped by a rocky white head with excellent retention and sheets of lacing. Smells immediately of dark chocolate, toast, peanuts, toffee, and damp earth. Very pleasant. The taste is a perfect balance of creamy dark and milk chocolate, caramel, toffee, peanuts, golden-browned toast, and a touch of fertile earthy bitterness on the finish to balance things out. Beautifully crafted and delicious. The mouthfeel seems a bit thin, but that allows for perfection sessionability. Medium carbonation with a very clean finish, save for a hint of momentarily lingering stickiness. This is hands down the best American English Brown Ale I've ever had, and easily one of the best brown ales I've ever had. Splendid! Presentation: 16 oz. can without dates. Served in a Samuel Adams pint glass. Appearance: It pours with authority to create a thick, three finger head. It has a deep, dark amber color. Smell: The smells are sweet, malty, caramel and toffee a hint of hops in the background. Taste: Malty and sweet with low bitterness. The main notes are of caramel, mixed nuts and grains. Mouthfeel: Medium bodied with high carbonation. It goes down smooth. Overall: The high carbonation takes away from the sweet and smooth experience; which is a bummer because this is a pretty good brown ale. Not "the brown ale to end all brown ales", as the can claims, but good. Can into pint glass. Pours a clear. dark cola color with a thin light tan head. Initial impression is bitter chocolate, roasted malts, maybe some burned acorns too. Mouthfeel is dry and astringent. Carbonation is medium. Finish is dry and bitter. 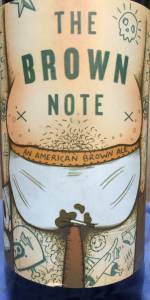 Brown Note is a good example of an American Brown Ale. Not my favorite style, but this was pretty good. Poured into a 20 oz. mug from a 16 oz. can so I can swish and swirl. Does not require a strong pour, good carbonation. Very dark brown, almost opaque. Dark amber when held up to a light. Frothy tan head that does not last to long but comes right back with a little swish. Some lacing. Roasted malt dominates the smell, coffee, roasted nuts and bitter chocolate are more present in the taste plus some pumpernickel. Sweet round mouth feel thins and dries out towards the middle, medium hop bite at end. This is a very malty semi-sweet brown ale which balances the hop bitterness almost perfectly. The label art is off the wall, and the braggery--there are better brown ales out there but this is way better than average. Can, dated 1-15-18, I believe. Nonic pint. A: pours a medium brown, barely translucent, with a thick and foamy two-finger head and highly active visible carbonation. That head lasted to the end of the glass. A giant sheet of lacing on the opposite side of the glass. S: I can tell this is still too cold, but even with that I can smell loads of chocolate, nutty, goodness. There is a strong dose of Englishness to this; can’t chalk it up to yeast, so it must be the fuggles. This smells exactly right for an American take on an English nut brown. Perfect, did you hear me? T: chocolate, Colombian coffee, bready middle, dry, earthy, woody hop finish. Not sweet. This is outstanding. M: lightest possible end of midweight. Fluffy ale texture. Pretty clean finish, actually. Dare I say, a refreshing brown ale? O: maybe I was just in the mood for a brown ale, but it is one of my favorite styles, and although there are lots, I think there are only three or four really good ones, and this is one of them. An absolute must try for lovers of brown ales or English-style beers. I’d love to do a side to side with Samuel Smith’s - it is that good. Low ABV and big cans mean this would be a great one for fall tailgating. Will buy again as soon as I can. My only detraction is the tasteless can art. Apart from that, this really is the epitome of what I look for in a brown ale.